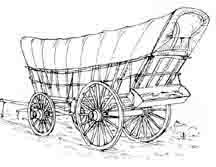 The first Conestoga Wagons, also known as Dutch wagons in the 1700’s, were modifications of German and English wagons. The Conestogas, however, had a longer and deeper body with a floor that sagged towards the middle to keep freight in place on steep inclines. Some craftsmen added extra curvature to the body to give it more eye appeal. The ends of the wagon body and canvas cover also bore quite a slope. The first wagons were farm wagons carrying loads up to a ton, while later wagons carried up to six tons and were considered a form of portable storage. Four to six oxen were used to pull the heaviest loads. The “Prairie Schooner” is a smaller lighter wagon that evolved from the Conestoga and became the backbone of western migration until the advent of the railroad which displaced it. 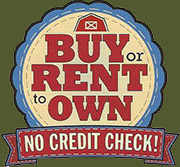 The Conestoga wagon incorporated many innovations that added strength and durability to its service. For instance, every point of strain was reinforced by iron, and all rubbing parts were given iron plates. Only seasoned hardwoods were used and the design of the body and carriage gave the wagon an exceptional maneuverability in rough terrain, given its size and weight. The craftsmen of the day took great pains to construct a durable and attractive wagon that would give many years of servce.